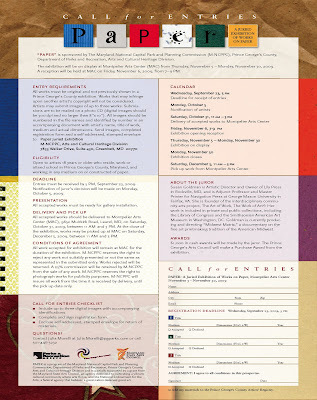 Call for Entries for the Prince George’s County Juried Exhibition. The exhibition is open to all artists who work, live or go to school in PG County, MD. CALL FOR ENTRIES: As part of FotoWeek DC 2009, WPA will present an exhibition of photography selected exclusively from the ArtFile Online (AFO) by the acclaimed documentary photographer, Jim Hubbard. In 1989, Hubbard created Shooting Back, a Washington-based organization dedicated to empowering children at risk by teaching them photography. For this exhibition, Hubbard invites photographers to submit works that are relative to today's economic hardships. Music by David Potts-Dupre and friends. This is a public celebration and no preregistration or donation is necessary to attend, though both are greatly appreciated for planning and fundraising purposes. Any size contribution (all tax deductible) will help! -Your contribution to the Takoma Foundation is tax deductible. -Matching funds for project have been awarded by Maryland Main Street via Takoma Main Street. -Helping to beautify Old Town Takoma with public art. -World-class mural artist Byron Peck's work will be landmark in gateway location. The DC Commission on the Arts and Humanities will be hosting 50 dance performances at 14 venues around the District from August 28-30 for the 6th Annual Dance DC Festival. Through this yearly festival, the Commission exposes District residents to a wide array of folk and traditional music and dance from around the world. Some genres include hip-hop, salsa, swing, tango and many more. Performances and interactive workshops will be free to the public over this three-day event. The performances will take place at venues such as The National Zoo, Atlas Performing Arts Theatre, Dance Place, Dance Institute of Washington, the National Museum of the American Indian, Columbus Circle, Bohemian Caverns, Anacostia Art Gallery & Boutique, John F. Kennedy Center Millennium Stage, Ebenezer's Coffee House, Heritage Center at Navy Memorial, Ft. Dupont Park and Honfleur Gallery. Last year Dance Festival DC took place in ten venues. This year more venues were added to the program to expose the city, not only to our great performers, but also the many arts venues in the District. Completed Edgewood - a set on Flickr: "Completed Edgewood"
If you missed the official opening of the Edgewood Mural, please see photos by see photos by Mika, Jazi, Dan Rosenstein and Chip Feise. Meet the artists, Pose 2, Decoy, Chor Boogie, Joshua Mays and Quest Skinner in a comfortable cool place August 27 from 6pm to 8pm. They are presenting their work on canvases along with photos of the past work and ideas for the future. The event is organized by the Pink Line Project and is in the new Solea Building on 1405 Florida Avenue NW, Washington, DC. Great article in the Washington Post by Blake Gopnik on Sculptor Jim Sanborn's newest creation. Blake Gopnik - The Story Behind Jim Sanborn's Latest Artwork, 'Terrestrial Physics' - washingtonpost.com: "Sparking Interest Within the Sphere of Art"
Metasebia Yoseph is the winner of the Define Live-Work contest? See the Solea space, which will be transformed by designers Fabian Bernal and Sarah Aburdene, who have been inspired by the winning idea. Soundscapes by DJ Gold and Riddle. Art exhibit by Albus Cavus. A raffle for art provided by Albus Cavus. International Arts & Artists is a non-profit organization dedicated to increasing cross-cultural understanding and exposure to the arts internationally through exhibitions, programs and services to artists, arts institutions, and the public. Celebrate the completion of the Edgewood Mural tomorrow. The mural will be officially given to the community by the Mayor Adrian M. Fenty on Monday, August 24th at 4:30pm. There will performances by the young artists from the Summer Youth Employment Program. The ceremony is in the parking lot of Rhode Island Avenue Center (behind Safeway and CVS) on 540 Rhode Island Ave NE, Washington DC. "From Edgewood to the Edge of the World" is commissioned by the D.C. Commission on the Arts and Humanities, Art in Public Places Program. Created with assistance of young artists from Summer Youth Employment Program, Beacon House, neighbors and local artists. The featured artists are: Pose 2, Decoy, Chor Boogie, Joshua Mays & Quest Skinner. As part of the current exhibit, Screenprinting Today / A Regional Survey of Contemporary Screen Prints & Related Works, the Athenaeum presents a Gallery Talk with curator, Dennis O'Neil, of the Hand Print Workshop, and Susan Goldman of Navigation Press this Sunday from 4 to 6 pm. They will discuss collaboration in the printmaking process, illustrating their talk with examples of prints in various stages of production. In Screeprinting Today, O'Neil has put together a collection of screen prints and related work representing his view of the very best work being done in our region including: Christine Carr, William Christenberry, Georgia Deal, Aaron Fay, Michael Gross, Carolyn Hartmann, Elizabeth Klimek, Alex Kondner, Pepa Leon, Nick Popovici, Chakraphan Rangaratna, Tanja Softic, Renee Stout, and Noelle Tan. The exhibition is open through September 6th. For the LottoHEART project, each artist made two works: one was exhibited as part of the game show fundraiser 4th of July weekend – but half was put aside for a lottery program called Blind Date. The event in July was a grand success: with about 100 works from the Blind Date group left. The work is great, and people just need to see it. Luckily, Gallery C (20 Baltimore Ave, Rehoboth Beach DE) has offered the gallery through September to exhibit the remaining work so lots of folks can see the work. All proceeds to CAMP Rehoboth. The excitement continues with . . . BLIND DATE Revealed. >>>> Visit the Blind Date gallery here! CAMP Rehoboth is a non-profit, gay and lesbian community service organization, originally developed to “Create A More Positive” relationship among all the people of the Rehoboth Beach area. Over the last 18 years it has grown into a full service community center with a multitude of activities, events, and programs. CAMP Rehoboth, Inc. is tax exempt under section 501(c)(3) of the Internal Revenue Code. Contributions and gifts are tax deductible as charitable contributions. Mark your calendars for this wonderful expression of ideas! As an artist member, what do you NEED? Join IA&A Founder and President, David Furchgott and Lachelle Slade, Membership Director for the second International Arts & Artists Artists' Forum! David Furchgott and Lachelle Slade will be available to address artists' comments, concerns, and listen to suggestions of what you want and need as an artist or arts supporter. Bring guests with you! Whether they are friends, family, or co-workers, IA&A wants their opinion on what they need and want as an artist or arts supporter! International Arts & Artists is dedicated to serving the artist community locally, nationally, and internationally. IA&A continues to develop distinct and relevant services designed to enhance careers in the visual arts and to foster a sense of community. To continually improve the membership program, and through your suggestions, please do not hesitate to inform IA&A of services that you would like offered, suggestions on the improvement of the membership program, or anything else that comes to mind regarding your satisfaction! Stay tuned for some exciting news from Pink Line Project... a new website is in the works and it's awesome!! Soon to be your favorite stop for news on the arts that's happening in DC. I'll keep you posted and so will Philippa Hughs. Check out hoogrrl's website for art events this week. The Collectors Choice (formerly known as the C-Note Sale), is a fast-paced, lottery-style auction promoting art collecting. It is attended by avid visual art enthusiasts every year from novice and sophisticated collectors from the Northern Virginia and Washington DC metropolitan areas. The Contemporary Museum will explore the potential of the fax machine as a device for creating, transmitting, and distributing an artist’s ideas and images with FAX, announced Contemporary Museum Executive Director Irene Hofmann. The exhibition will feature more than 120 fax-based works, on view from September 12 through December 20, 2009. The Contemporary is the first institution to host FAX during its national tour. In FAX, the exhibition’s dedicated fax machine will continually receive and print incoming communications by artists from around the world. As faxed artworks arrive, they will be added to the gallery walls. In addition to the hundreds of faxed images, the exhibition will include the inevitable transmission errors and junk faxes received during the run of the show. The exhibition invites visitors to explore artists’ creative expression through their drawings and to consider ideas of reproduction, originality and distribution. FAX will feature works created by more than 120 international artists, designers, architects, scientists, and filmmakers who utilize the fax machine as a thinking and drawing tool. Visitors will see drawings, text, and collage works from contributors including Joseph Grigley, John Armleder, Fia Backstrom, Barbara Bloom, Liam Gillick, Glenn Ligon, and Kay Rosen. Included in the diverse roster of contributing artists are 20 Baltimore-based artists including Hugh Pocock, Leslie Furlong and Soledad Salamé. For more information about FAX, teenFAX, and the Contemporary Museum, visit www.contemporary.org. Alan Binstock’s work primarily integrates stone, glass and steel. He constructs forms that evoke a dynamic material tension while simultaneously setting forth a harmonious balance between outer shape and inner structure. In addition to making sculpture, Mr. Binstock has worked as a Registered Architect and Project Manager in several area firms and at NASA's Goddard Space Flight Center for several years. This ongoing education in construction methods and materials, along with his studies in yoga, inform his sculpture and challenge his aesthetic directions. Mr. Binstock was born and raised in the Bronx and currently lives in Mt. Rainier, MD. Norman Parish was selected by the WSG to serve as a juror for this series of shows. Mr. Parish has owned and operated Parish Gallery-Georgetown in Washington, DC for the past eighteen years. The gallery was opened primarily, but not exclusively, to showcase contemporary visual artists of significance from Africa and the African Diaspora and lesser known local artists. Mr. Parish wanted to show high quality art that had been overlooked and give solo exhibitions to artists who deserved one, but had never had the opportunity. He came to the point of gallery owner having been a painter himself for over forty years. The Washington Sculptors Group (WSG) is a volunteer, non-profit organization dedicated to promoting an awareness and understanding of sculpture in addition to fostering the exchange of ideas among sculptors, collectors, and the general public. The WSG sponsors frequent events, including artists' panels, presentations, workshops, public programs, and co-sponsors a variety of exhibitions in museums and alternative spaces in the Washington DC area and beyond. Organized in 1983, the work of the WSG is carried out by its Board of Directors, along with its nearly 400 members. For additional information, visit www.washingtonsculptors.org. This Saturday, August 15th, check out (and take part in) Mural Jam, the "capital’s largest public art event" at the Rhode Island Avenue Shopping Center (next to the Rhode Island Ave Metro station) to see over 100 artists paint a football field-sized wall. The event is the culmination of local muralists mentoring kids over the past couple months in developing and designing public art. Watch them work from 10 a.m. to 8 p.m., or even pick up a brush and join in. The event is free and geared towards all ages. It will feature activities for children, food, a community area for everyone who comes to pick up a brush and paint, and DJs with music for entertainment. The event is sponsored by Albus Cavus, D.C. Commission on the Arts and Humanities, and the Mayor's Summer Youth Employment Program. VISITING THE Katzen Arts Center at American University, one would not expect to see 12,000 pounds of clay lying on the floor. But that's exactly what's at the museum through Sun., part of Margaret Boozer's exhibition "Dirt Drawings." "Usually, a museum is designed to take care of objects rather than foster their growth and evolution," says Katzen director and curator Jack Rasmussen. "This show is about the artistic process, instead of rows of pots." Katzen Arts Center, 4400 Massachusetts Ave. NW; through Sun., Aug. 16; 202-885-1300. Patrick Burke, David Cook, Joe Corcoran, Cheryl P. Derricotte, Nancy Donnelly, Sean Hennessey, Michael Janis, Steven Jones, Brendan Kager, Jennifer Lindstrom, David D’Orio, Anne Plant, Ragan Sheridan, Erwin Timmers, Megan Van Wagoner and Sue Weisenburger. Hyattsville, MD – For the first time, Washington Glass School and DC Glass Works will join together for a one-of-a-kind exhibit of glass and sculpture, “The Common Element”. At artdc Gallery in The Lustine Center of Arts District Hyattsville, 16 artists will display their work, consisting of hand-blown glass, molded and welded sculptures, poured aluminum and bronze, and other techniques." Discover glass and sculpture from the area’s leading artists. Purchase a piece to display in your home or office – or mingle with instructors from both schools. One of the nation’s leading warm glass studios, The Washington Glass School, has joined forces with the area’s largest hot glass studio DC GlassWorks. This collaboration has delivered an outstanding sculptural exhibition of work by the member artists and instructors. The Washington Glass School is known for narrative and content-driven glass work, and DC GlassWorks has become an area favorite for sculptural blown glass artwork. Together they integrate the common element. In The Flesh Part II is an exhibition that focuses on contemporary figurative art. This exhibition opportunity attracted close to 300 artists from around the country and world providing the juror with well over 830 images with which to choose for this exhibition. Our juror chose 27 works mostly two-dimensional paintings, drawings, mixed media, and photography but also a couple of three-dimensional works, one of which is a very large installation piece. 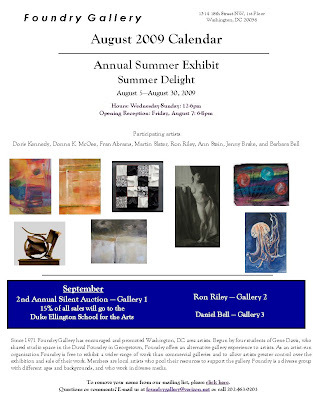 The Target Gallery, national exhibition space of the Torpedo Factory Art Center, is located on the waterfront in Old Town Alexandria, VA.
"The Phillips Collection continues their Phillips After 5 events every Thursday through August. Tonight enjoy snacks from Fresh Farm Markets, DJ Danny Harris of Fatback D.C., a screening of the film The Diving Bell and the Butterfly (6 p.m.), and gallery talks on Blitzkreig Shock: Postwar Trauma’s Effect On Painting (6 and 7 p.m.)." A segment of AVN's monthly magazine show, "Here/now", "Artscape" takes a look at all things cultural around Arlington. In this episode, Philippa Hughes, founder of the Pink Line Project, and Jon Palmer Claridge, Program Director for Arlington Cultural Affairs, offer a behind the scenes tour of the new Arlington Cultural Center, scheduled to open in the fall of 2010. Thursday, Aug. 13, from 5 – 6 p.m.
Join Hillyer Art Space for a unique opportunity to glimpse into the minds and ideas behind the work of Six in the Mix: Selections by Renee Stout, which features the work of Cianne Fragione, Adam Griffiths, Kenyatta Hinkle, Marc Roman, James Swainbank, and Gilbert Trent! This is the third year for My Space on 7th. It’s a unique, non-juried opportunity for local artists to exhibit at Touchstone Gallery. In a short time, My Space on 7th has become a gallery tradition. Due to proposed renovations for the 406 7th St building, this might be the last My Space on 7th. Artists participating: Sangeeta Agrawal, Nataliya Andreyeva, Neyla Arnas, Keith Arnold, Olu Babalola, Crystal Banks, David Barr, Mark Behme, Pat Bennett, Gary Bergel, Olga Berman, Carl Bettenhausen, Harmon Biddle, Wendy Bridges, Marsha Brown, Kirstin L Bruner, Alza Burd, Pierre Cartier, Adam Chamy, Zhee Chatmon, Anne Cherubim, Rob Chester, Mark S. Chevalier, James Coates, Ceci Cole McInturff, Michele Cormier, Charlie Dale, Anthony Dortch, Matt Dunn, Derran Eaddy, Linda Elliff, Michelle Fatovic, Alex Feshenko, Isabelle Spicer, Kim Frietze, Kent Gay, Eric M. Ginsburg, Marcia Green, JoAnne Growney, Jackie Hoysted, Sandra Humphrey, Carin A. Jackson, Jessica Jastrzebski, jodi, Linda Keller, David Korte, David A. Kosar, Radha Krishnakumar, Mary D. Lambert, Paula Lantz, Emery J. Lewis, Mary Mallia, Frank M. Mancino, Amy Marshall, JoAnn McInnis, Ivan Mendizabal, Mark Mennie, Anita Merina, David Mills, Del Moran, Kiran Mukunda, Carlos Munoz, Natalie Oguara, Mary D. Ott, Samuel Pastore, Wendy Plotkin-Mates, Keith Ramsey, Juvale Regala, Marina Reiter, Neil Rogers, Pam Rogers, Julia Rosenbaum, Deborah Saks, Zakhar Sasim, Peter Schechter, Charles A. Sessoms, Amelia Shachoy, Paul Sharratt, Janathel Shaw, Raju Singh, John Sislin, Destry Sparks, Aaron Spindler, Ulrich Stein, Elena Tchernomazova, Dana Thompson, Sally ShangMing Tsou, Caroline Urbania, Susan Van Pool and Monica Wise. Innocence & Arrogance: The Art of Arabella Proffer and Brandi Read. These two pop-surrealist and neo-realist women artists have teamed up to create an exciting exhibition of Punks, Goths, Muses, Models and Royalty. Both artists’ exquisitely rendered subjects go beyond the typical portrait, encompassing uniquely distinctive vitality and style, and exposing viewers to both of their whimsical insights and flights of imagination. An exhibit of glass artwork from artists of the Washington Glass School and DC GlassWorks are featured in a show that links the two DC-area glass institutions:The Common Element. 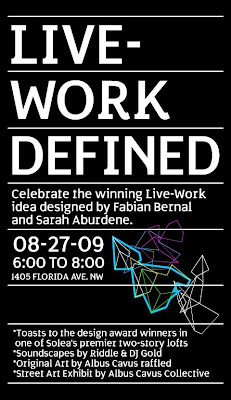 Hosted by the organization ArtDC.org (in their new Hyattsville gallery at the Lustine Center), the collaborative spirit of the two studios is celebrated in this groundbreaking art show. Artists include: Patrick Burke, David Cook, Joe Corcoran, Cheryl P. Derricotte, Nancy Donnelly, Sean Hennessey, Michael Janis, Steven Jones, Brendan Kager, Jennifer Lindstrom, David D'Orio, Anne Plant, Ragan Sheridan, Erwin Timmers, Megan Van Wagoner and Sue Weisenburger. This Saturday marks the opening of Irvine Contemporary's Introductions5. The event is the fifth annual exhibition of works by recent art college graduates from around the nation. The exhibition is designed to bring a highly select group of new artists from leading art college programs to Washington, D.C. The eight invited artists for this year’s Introductions were selected from leading MFA programs across the US. 1412 14th St., NW, near P St., in the 14th Street Arts Corridor and Logan Circle area of Washington, DC. “The magic moment is to finish a piece and like what you see,” says Josephine Haden, whose work will be on view at the Virginia Museum of Fine Arts June 5 - Sep 13, 2009 in an exhibition titled Stranger Than Paradise." "Haden lives in Arlington, Va., and was the winner of a 2009 VMFA Fellowship." The exhibition will be on view in VMFA’s Pauley Center through Sep 13, 2009. Six in the Mix: Selections by Renee Stout brings together a divergent company of D.C. and Baltimore's emerging and mid-career artists for Hillyer Art Space's summer program. This show will feature the work of Cianne Fragione, Kenyatta Hinkle, Adam Griffiths, Marc Roman, James Swainbank, and Gilbert Trent. Stout has set out to create a mixed bag of local talent not based in the obligatory conceptual framework predominantly exhibited in group shows. Instead of the varying inspiration and ideas behind the individual bodies of work, it is the "natural dialogue that may occur between these works" which Stout would like the audience to experience. 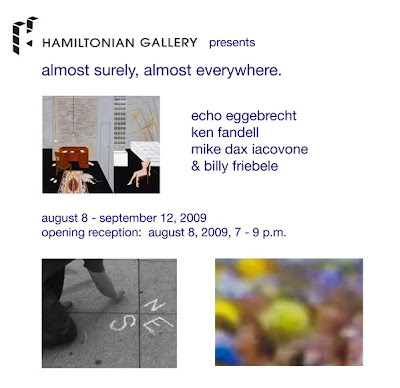 Hamiltonian Gallery and curator Rebecca Jones are pleased to present “Almost Surely, Almost Everywhere”, a group exhibition featuring works by Echo Eggebrecht, Ken Fandell, Billy Friebele and Hamiltonian Fellow Mike Dax Iacovone. The exhibition runs from August 8 until September 12, 2009, with an opening reception on Saturday, August 8, from 7 – 9 p.m.
Each of the artists in this exhibition investigates the experiential nature of humankind's existence within a world of immeasurable space, infinite possibilities and continual journeys. The terms “almost surely” and “almost everywhere” are encountered in probability theory where questions involving infinity are posed. Through the use of physical acts, mediated images and painterly expressions of the mysteries of intangible space and time in our physical world, this group of works presents attempts to approach the stability of “sureness”, the absolute encompassment of “everywhere” and the enigmatic results of these endeavors. Kriston Capps writes about the relocation plans of a 14th Street Gallery. G Fine Art, widely acknowledged as one of the premiere contemporary art galleries in Washington, D.C., will close in August. Housed on the second floor of a three-story galleries building, the gallery—whose stable features some of the most innovative and visible artists in the metropolitan area—will not renew its release after its current show closes, according to gallery director Annie Gawlak. "In the past couple of years, half of all the staff arts journalism jobs in the US have been eliminated. In some cases, newspapers offloading their staff critics have replaced them with freelancers. In some cases, the freelancers have done a better job than the staffers they have replaced. But mostly not." So the Annenberg School for Communication at USC and the National Arts Journalism Program are holding a summit on the future of arts journalism October 2. They're looking for projects that are trying to become that brilliant next model. Washington, D.C. (July 2, 2009) - The first survey of the work of the late Yaddo sculptor Anne Truitt, long considered a pioneering figure in the development of American abstract art, will open in October at the Smithsonian's Hirshhorn and Sculpture Garden. "Anne Truitt: Perception and Reflection" will be on view October 8, 2009 - January 3, 2010. It will feature more than 35 two-dimensional works alongside 49 painted sculptures that were the hallmark of the artist's 40-year career. The exhibition, which will be accompanied by the only complete monograph on the artist to date, will trace the arc of Ms. Truitt's career from initial abstract sculptures through pieces made only weeks before her death at age 83 in 2004. The fully illustrated book has essays by Curator Kristen Hileman and James Meyer, Winship Distinguished Associate Professor of Art History at Emory University, and a chronology of the artist's life and career. "This exhibition is a long-awaited look at the depth and scope of this significant artist's work," said Richard Koshalek, director of the museum. "We are pleased to present this exhibition here on the National Mall and to recognize her unique contribution to art history." A separate gallery in the museum will feature the short film Anne Truitt: Working by Jem Cohen, a Yaddo colleague and friend of Ms. Truitt. The film includes images of Truitt's studios in Washington, D.C., and at Yaddo, and features the artist working and speaking about her practice and the role of color in her art. A recipient of Guggenheim and National Endowment for the Arts fellowships, Ms. Truitt was an influential professor at the University of Maryland at College Park (1975-1996) and the author of three acclaimed autobiographical journals – Daybook (1982), Turn (1986), and Prospect (1996). She was a Yaddo guest artist more than a dozen times between 1974 and 2003, a longtime Member of The Corporation of Yaddo, and served as the acting executive director of Yaddo in 1984. For exhibition hours and related programs, please click here. For more information about Ms. Truitt and additional images of her work, click here.